This colourful mattress set by Fisher Price is made using a premium quality soft cotton fabric which is comfortable for your baby's skin and allows him/her to breath better. Attractive prints of lion and monkey are digitally printed using advanced technology. The colour used on the fabric is safe for children and also for the environment. This mattress set comes with one pillow and two bolsters. About the Brand: Fisher-Price was founded in 1930 and today it is one of the most famous brands in toy world creating toys that fascinate and stimulate a child's imagination. In keeping with their long-standing tradition of innovation, quality, durability, safety and good value, Fisher Price offers products and services that consumers can trust to improve their family's lives. It is a wholly owned subsidiary of Mattel, Inc., the worldwide leader in toy products. Today, Fisher-Price is one of the world's leading manufacturers of babygear and preschool toy. 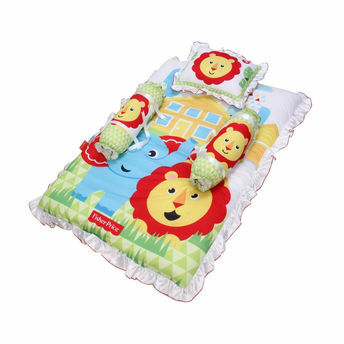 Explore the entire range of Baby Bedding available on Nykaa. Shop more Fisher Price products here.You can browse through the complete world of Fisher Price Baby Bedding .